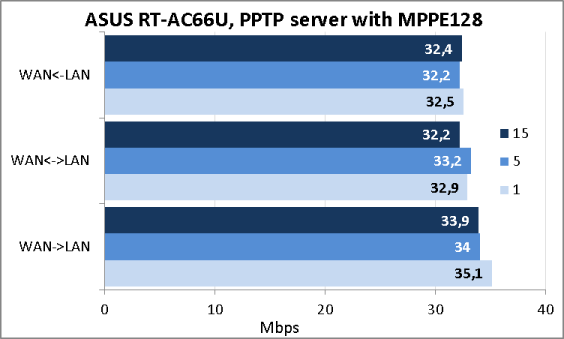 We didn't really have enough time to get used to all capabilities of IEEE 802.11n standard and now it is going to be replaced by another, newer one, IEEE 802.11ac. 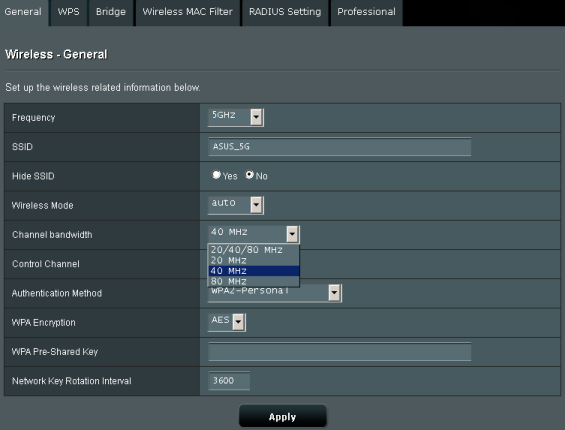 ASUS RT-AC66U wireless router that our laboratory hosts today has support of this very standard. This model offers never-before-seen data transmission speeds in 5 GHz range, 1300 Mbps, while the speeds of 450 Mpbs in 2.4 GHz range seem much more common. However, these figures are purely theoretical and in this review we are going to figure out in practice what speeds a common user is able to get using this device. 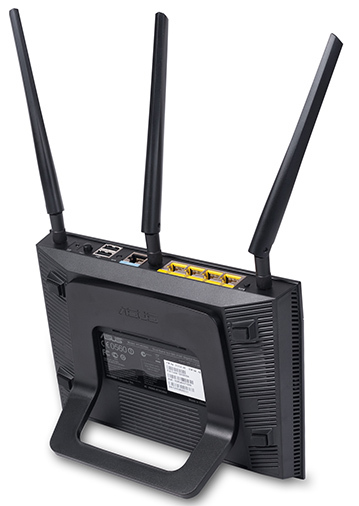 ASUS RT-AC66U wireless router comes in a black plastic case with dimensions of 207x153x38 mm not considering the antennae and support stand. To work properly the device needs an external power unit with the following characteristics: 19V and 1.58А. It's worth noticing that another device by this brand, RT-N66U, has the same type of case. The upper panel of the device consists of two parts, one of them is even and the other is ribbed. There are LEDs indicating operation of the router and its ports as well as the name and brand tag located here. There is also a ventilation grate on the bottom panel of the device. Apart from it, there are four rubber legs, two mounting holes used to mount the device onto the wall, and a sticker with brief information about the model located over here. If the device needs to be placed vertically, one may fasten a special support stand to the bottom panel of the device. The stand is included in the pack. On the rear side there are five Gigabit Ethernet ports (one of them is WAN and the rest are LAN), three connectors for external detachable antennae, two USB 2.0 ports, and power socket. There are also three buttons located over here, they are Power button that is used to turn the device on and off, Reset button used to reset the user settings, and WPS button that is used to facilitate the procedure of wireless client connection. Insides of RT-AC66U are one blue textolite card. A significant part of this card is covered by a huge radiator. Unfortunately, the only module accessible for inspection was the flash memory Zentel A5U1GA31ATS module with the size of 128 Mbytes. Firmware upgrade procedure is carried out in a conventional way for the majority of ASUS devices. One just needs to download the firmware image file from the vendor's web-site, enter Firmware Upgrade tab in Administration menu, and upload the file to the router by clicking on Upload button. The whole upgrade procedure takes about three minutes (not considering the firmware download time). 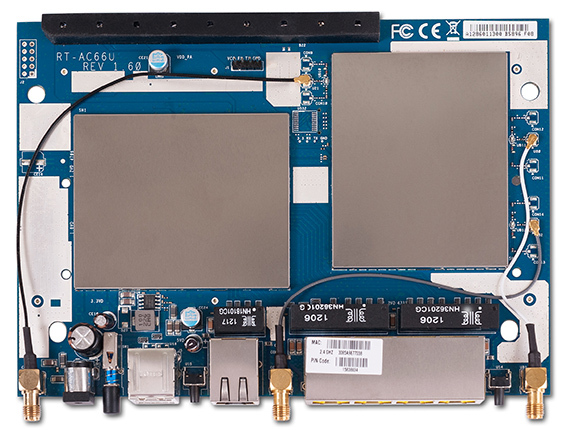 An administrator can check whether the firmware has been upgraded correctly using the same tab; information on the current firmware version is displayed over here. Also, information about the current firmware version is always shown in the upper part of the device web-interface. In case of a failure during the firmware upgrade process, RT-AC66U changes for rescue mode during which the Power indicator starts slowly flashing. Among other, circumstantial features that may indicate the transition to the rescue mode are changes in TTL field value in ICMP echo replies (100 instead of common 64). The administrator can manually switch RT-AC66U over to the rescue mode. To do that s/he only needs to hold Reset button for 10 seconds while the device is booting. To restore the firmware one may use a single-purpose utility called ASUS Firmware Restoration which only needs to know the path of the firmware upgrade file to restore it. After that the only thing left is to wait until the router is rebooted. Firmware restore can also be performed in fully manual mode; to do that the administrator needs to send the file with new firmware version through TFTP and reboot the device. 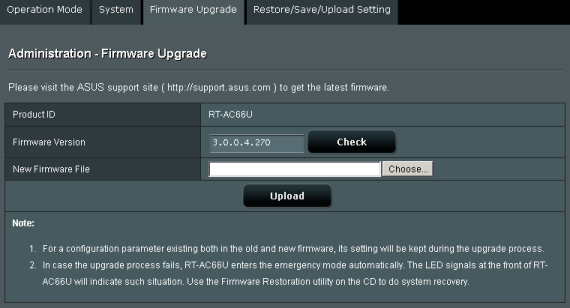 When in rescue mode, ASUS RT-A66U wireless router affords the administrator with another means of firmware restoration. It is a single-purpose web-server that is used to help the administrator to reboot the device, reset the user settings, or restore the firmware. One can access this web-server by entering 192.168.1.1 from a local network. Also, we would like to tell a few words about alternative firmwares. 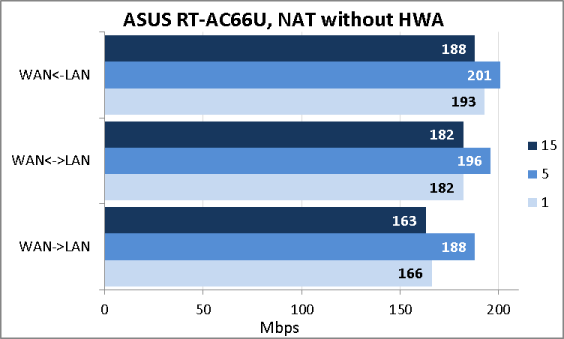 Since the hardware platform of ASUS RT-AC66U is similar to the one of RT-N66U, we hope to see more alternative choices of firmware available. However, when this article was being written, DD-WRT was only making its first attempts at customizing their firmware versions for operation with this router. The only thing we could find and make use of was firmware by Merlin. 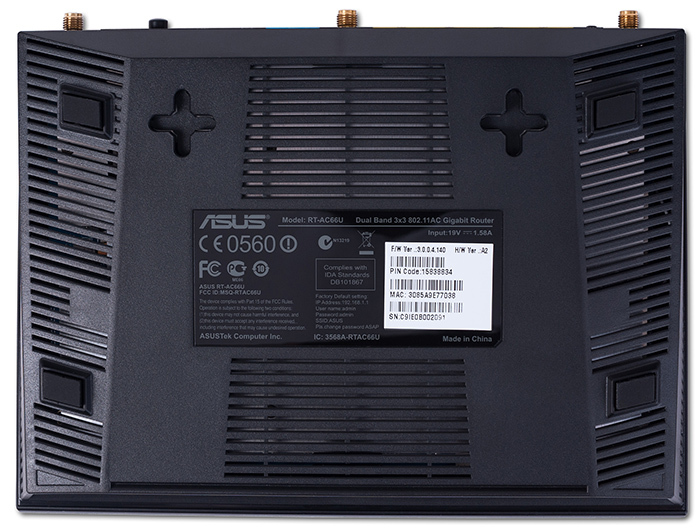 That is where we bring the review of the firmware upgrade process of ASUS RT-AC66U to a conclusion and pass on to examining the utilities available to users of the model. 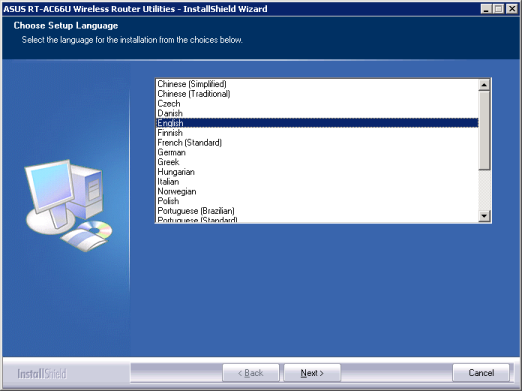 Interface of the software that comes together with the wireless router is available in 21 languages. 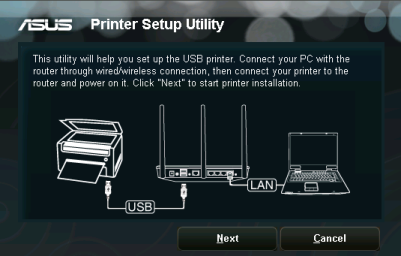 By using the automatically launching utility users can employ install wizard that facilitates the initial device configuration, install a printer connected to the device USB-port in the local system, enter the vendor's web-site, or install certain supplementary utilities. 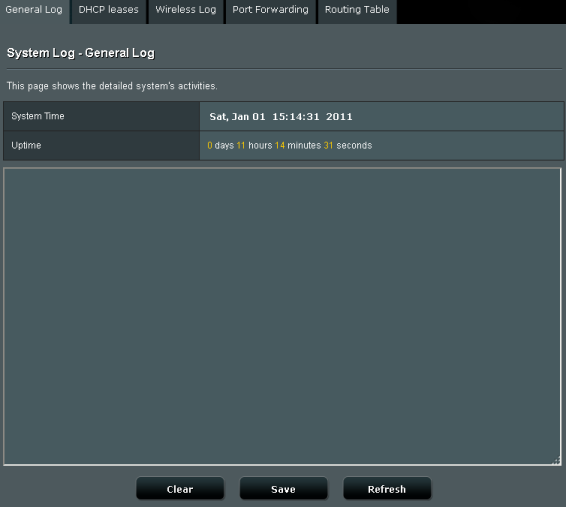 Among those there are: Device Discovery, Firmware Restoration and Router Setup Wizard. 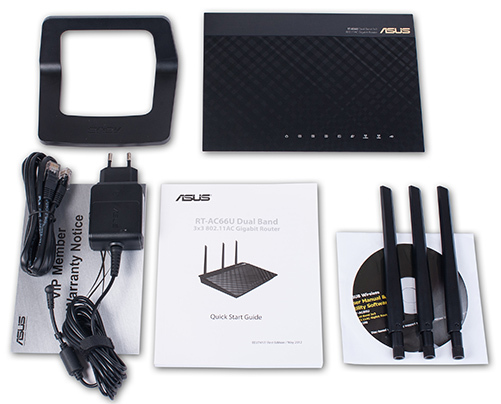 While we have already mentioned the latter, the other two give the administrator a possibility to detect online wireless ASUS devices and restore the firmware in case of a failure, correspondingly. We gave a detailed insight on Firmware Restoration utility in Firmware upgrade section of this review. 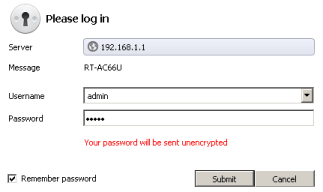 One can access the device web-interface using any modern browser just by entering 192.168.1.1 IP-address. By default the login and password are admin and admin. 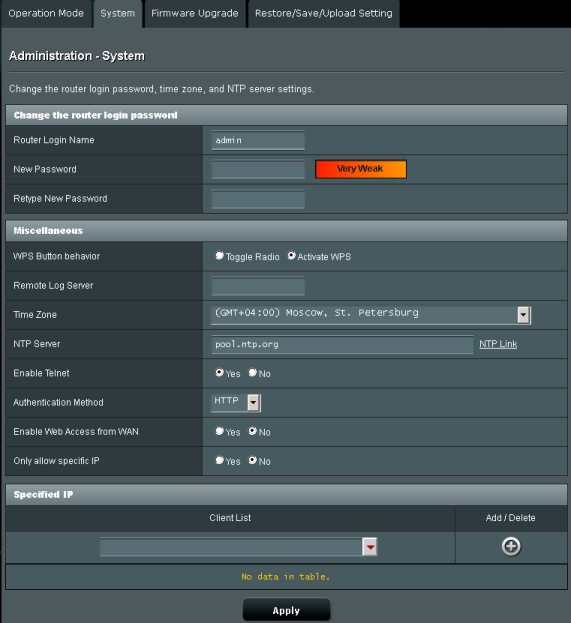 Upon successful authentication an administrator will find him/herself on the home page of the router web-interface, which is available in 19 languages. 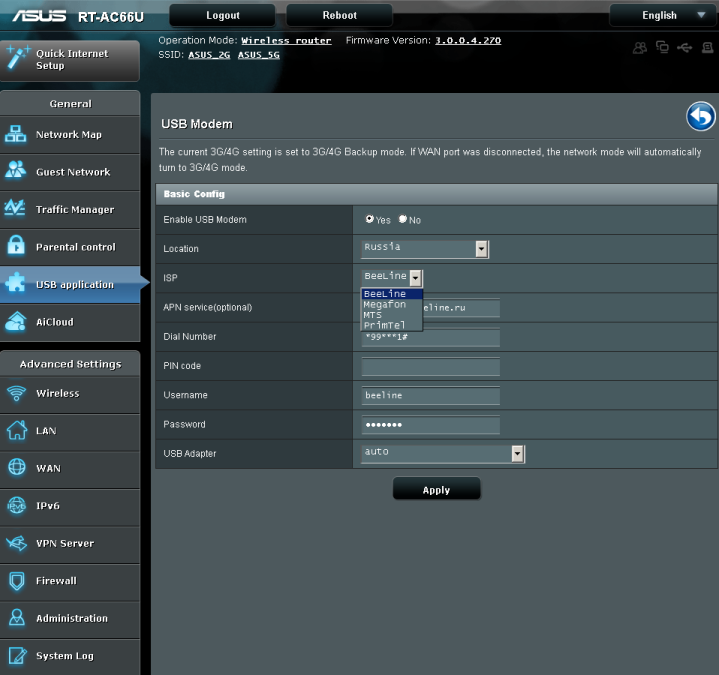 The web-interface design is quite customary to all devices with ASUSWRT firmware we have previously reviewed. We would like to inform our readers beforehand that we will not review all capabilities of RT-AC66U web-interface in detail, but only turn our attention to the most interesting features. 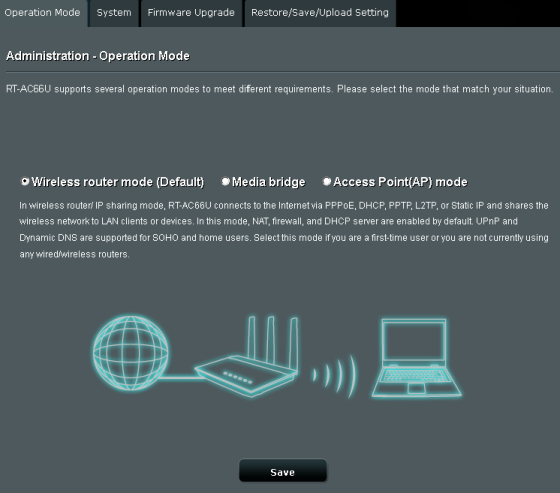 By using Guest Network menu item the administrator can create up to three wireless guest networks in every range. And though such networks allow gaining access to the WAN, the local resources rest unavailable. 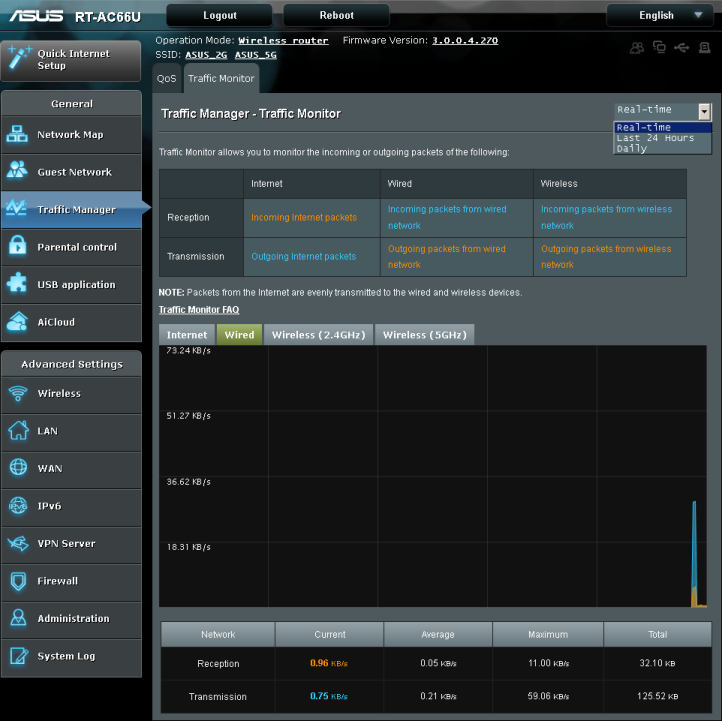 Using tabs located in Traffic Manager menu item one can manage QoS settings and view the utilisation of router interfaces. By using Parental control menu item the administrator can specify time intervals during which certain nodes are allowed the Internet access. 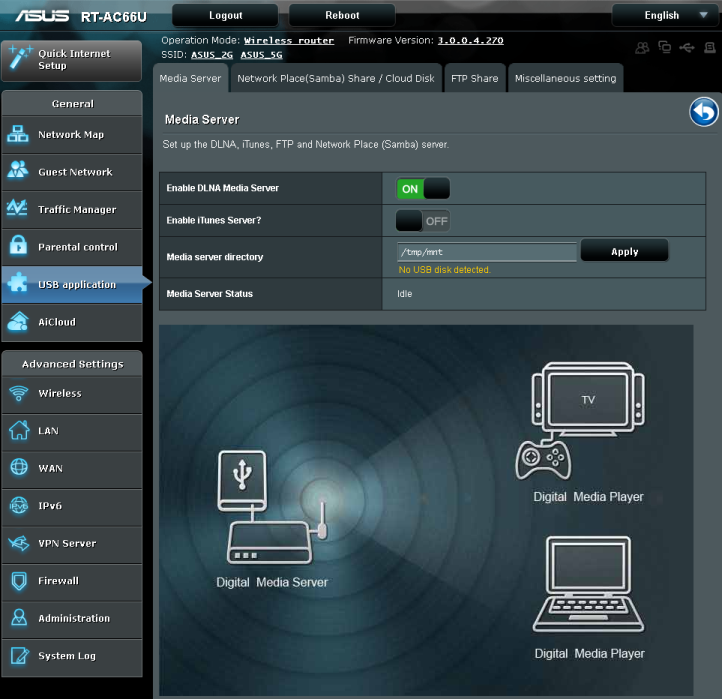 In USB application menu item the administrator can configure RT-AC66U as a network print server or UPNP server, provide shared access to the information stored on an external disk, connect modems for operation in 3G and 4G networks, as well as manage the download master. 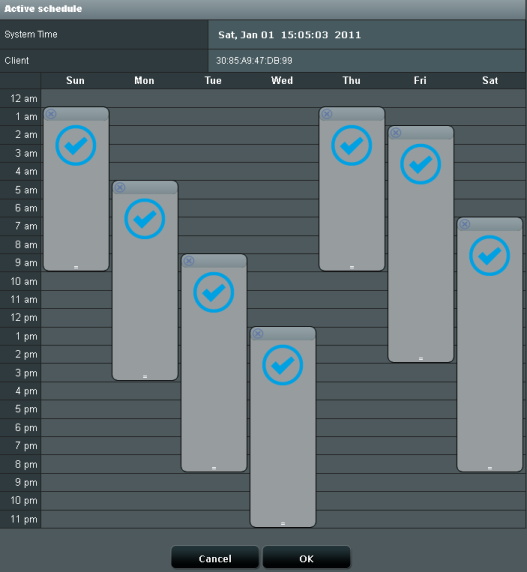 Using AiCloud feature one can gain access to the most rapidly growing cloud software of ASUS. 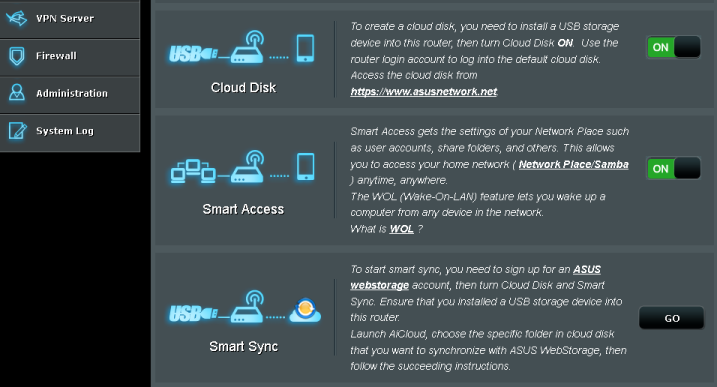 Over here users can configure access to an external HDD of the router or computers in a local network via Internet as well as manage synchronisation parameters between a USB disc and the ASUS cloud service. Growth of data transmission speeds in IEEE 802.11ac wireless network standard is associated with an increase in the channel bandwidth to 80 MHz in 5 GHz frequency range. 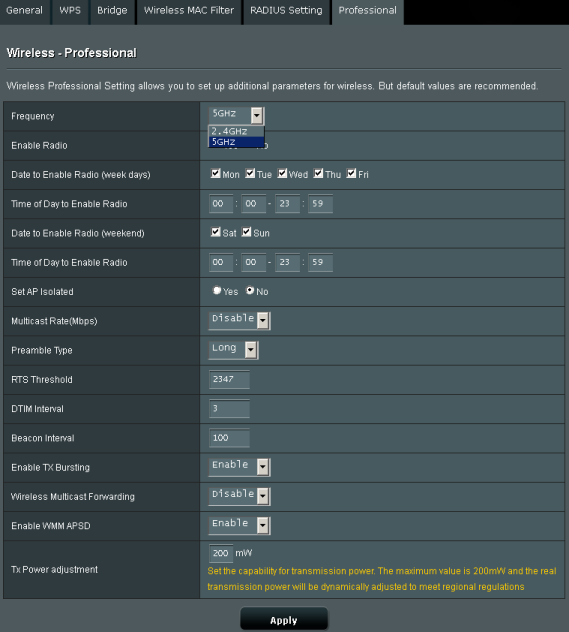 Corresponding settings can be applied in tabs of Wireless menu item. Wireless, WAN, and Firewall menu items do not really differ from the same tabs we came across while reviewing other wireless routers by ASUS. 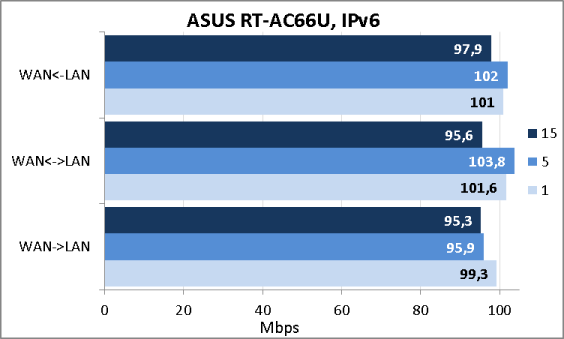 ASUS RT-AC66U supports IPv6 and the corresponding settings are located in the same-named menu item. 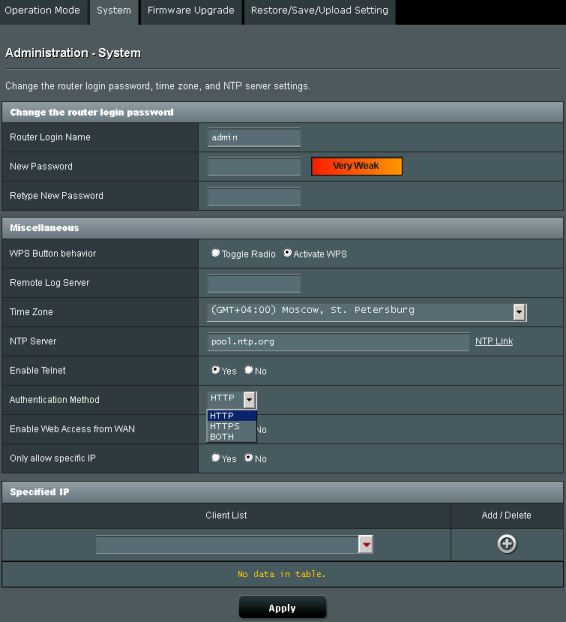 Tabs of VPN Server menu item allow the administrator to manage the router operation as a PPTP server enabling remote clients to connect to it. However, it's worth noticing that the translation of Broadcast support feature in the Russian language interface is not correct. 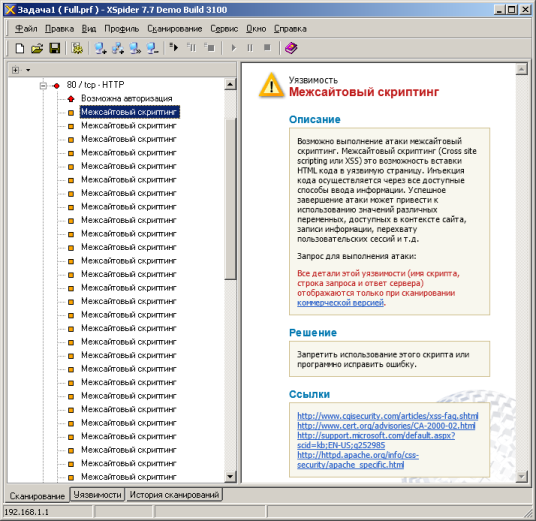 Actually, it allows transferring broadcast packets from one part of the network to the other, but in the Russian language interface it is translated as «Поддержка трансляции». By using tabs located in Administration menu one can choose the device operation mode, limit access to the router through HTTP/HTTPS and Telnet, specify time synchronisation parameters, upgrade firmware, and save/restore/reset the user settings. 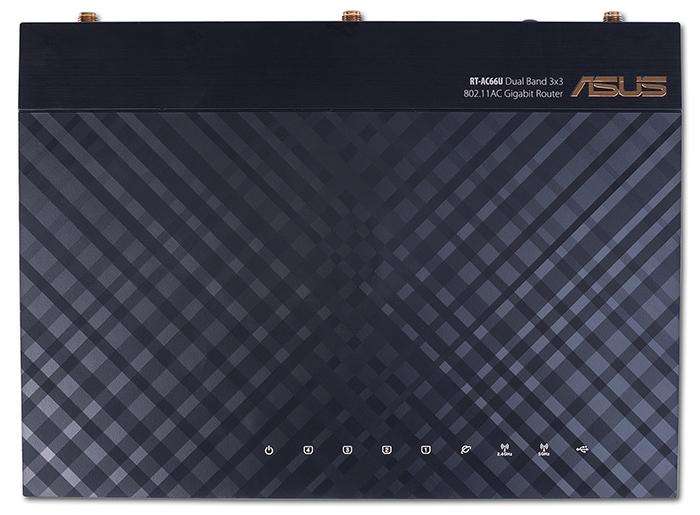 We would like to pinpoint attention of our readers to the device operation mode called Media bridge; in this operation mode ASUS RT-AC66U acts as a wireless adaptor allowing connection to the wireless networks in range, IEEE 802.11ac included. All system and wireless segment log data, information on operation of DHCP server and port forwarding service together with a routing table are available in tabs of System log menu item. 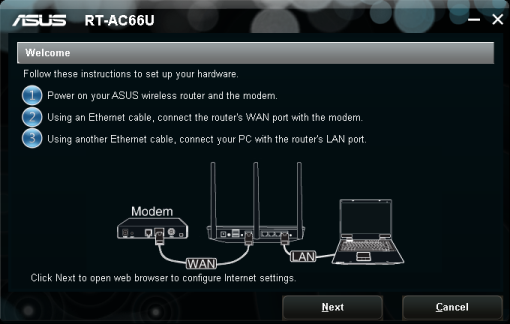 Let's now pass on to reviewing the command line interface of ASUS RT-AC66U wireless router. Users can access the device command line using HTTP and Telnet. In order to gain access via HTTP one must use Main_AdmStatus_Content.asp hidden page. Switching the access to the command line on and off through Telnet is performed using System tab, Administration group in the web-interface. One must use the same log-on information as for the connection to the device web-interface. Traditionally, BusyBox is installed in Linux 2.6.22.19 system. BusyBox v1.17.4 (2013-01-25 07:43:18 CST) multi-call binary. As we have already seen in the review of RT-N66U, /rom catalogue contains information about the firmware developers. Now let's turn to /proc catalogue to view its contents and find out the system uptime, its average utilisation, information on the CPU installed, and the amount of RAM. Actually, system uptime and its average load can also be learnt using uptime command. One can learn the list of file systems and encryption types supported in files named /proc/filesystems and /proc/crypto. The only thing we were unpleasantly surprised at was inability of add-on installation. We have already seen this kind of capability earlier in RT-N66U. That is where we bring the review of the device command line to a conclusion and pass directly on to testing it. The first testing procedure we usually begin our testing section with is estimating the booting time of the device, which is a time interval starting with the moment when the power is on until the first echo reply is received through ICMP protocol. ASUS RT-AC66U boots in 25 seconds. We believe that the result is decent. The next thing we usually do is conducting a security scanning procedure, which has been carried out using Positive Technologies XSpider 7.7 (Demo build 3100) utility. On the whole, there were 13 open ports discovered, and they are TCP-23 (Telnet), TCP-53 (DNS), UDP-53 (DNS), TCP-80 (HTTP), TCP-443 (HTTP SSL), TCP-515 (printer), TCP-3394 (d2k-tapersty2), TCP-3838 (Unavailable), TCP-5473 (unknown), TCP-9100 (Unavailable), TCP-9998 (Unavailable), TCP-18017 (HTTP), and TCP-34206 (HTTP). The most interesting data are presented below. Finally we are about to test the performance of the device. 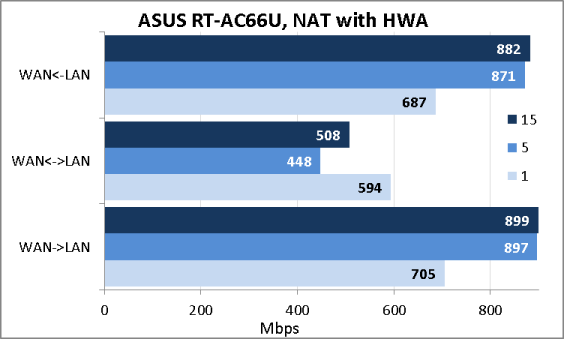 At first we tested the throughput of RT-AC66U upon execution of NAT translations with a hardware accelerator switched both on and off. On the first graph one can see that upon the simultaneous data flow in both directions the performance level is being decreased. Also, we measured routing speeds with no NAT executed. 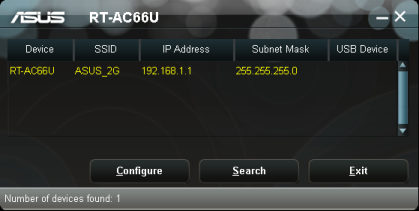 Neither have we overlooked a capability of the router to get connected to the provider using PPTP. 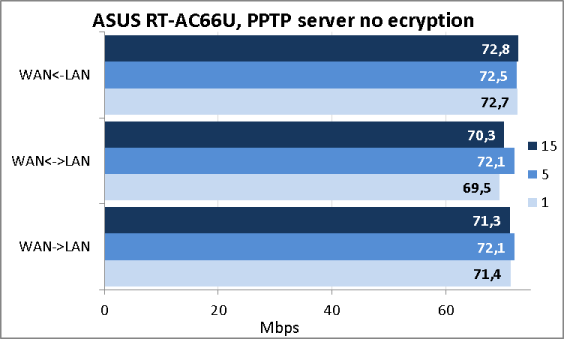 The graphs presented below show the performance of RT-AC66U operating through PPTP with and without encryption. 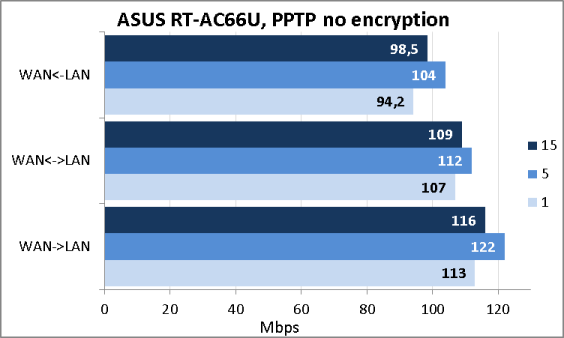 Since ASUS RT-AC66U has a built-in PPTP server, we have also decided to measure its performance with and without encryption. The same way, we didn't overlook the support of IPv6. We connected an external Transcend StoreJet 25M3 HDD with the capacity of 750 Gbytes to the router USB port and measured the data access speeds using Intel NASPT 1.7.1 utility. 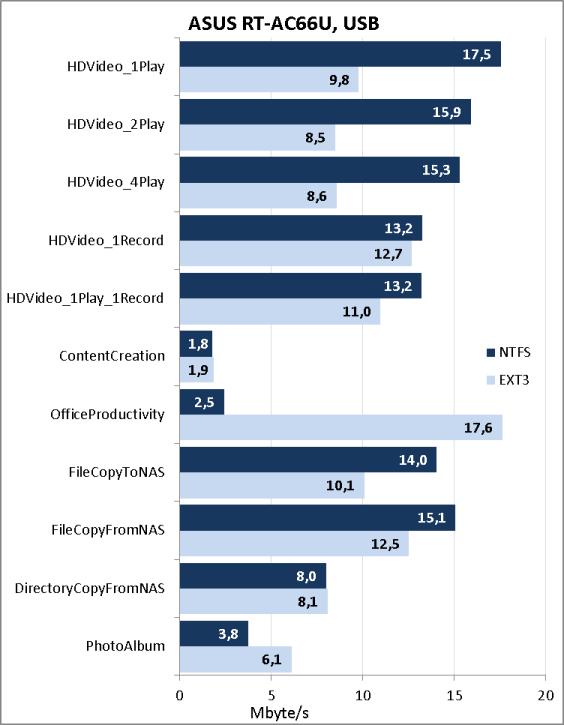 The diagram presented below misses one test (DirectoryCopyToNAS) since each time we tried to carry this test out in NTFS the router became unavailable. As a matter of course, we have informed the vendor about it. 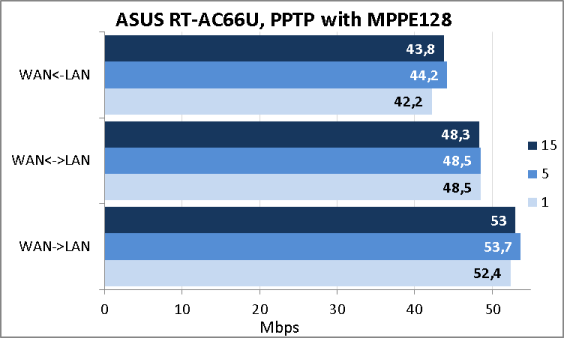 Tests on 802.11n standard wireless network showed exceptional results in both frequency ranges. 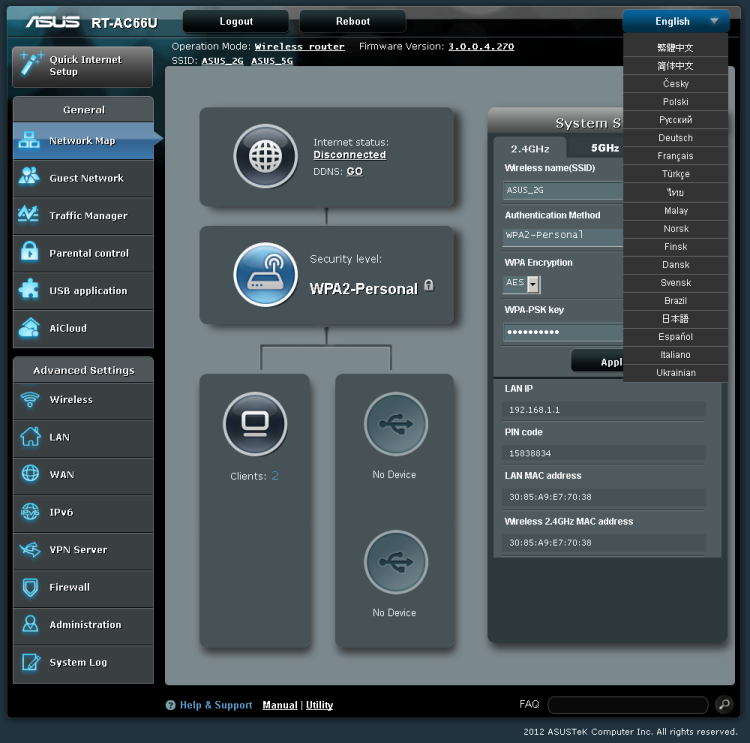 We have used ASUS EA-N66 as the client device. 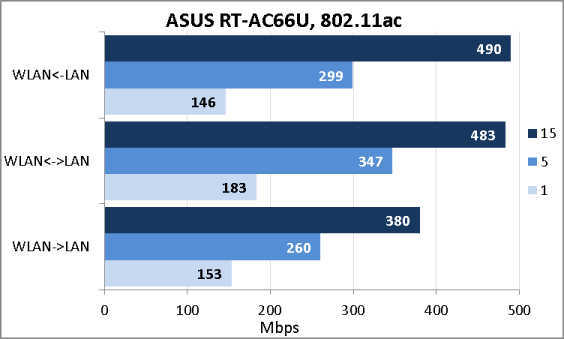 When this article was being written we didn't have any client device that had support of 802.11ac and that is why we decided to use one of the RT-AC66U devices instead. The corresponding settings were carried out using Operation Mode tab, Administration menu item. 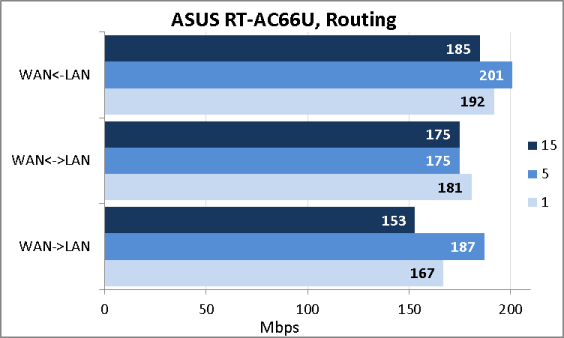 Unfortunately, we cannot compare the test results for 802.11ac we obtained to anything since ASUS RT-AC66U is the first router that supports this standard our laboratory has ever hosted; however, we believe that the speeds we received are decent enough. 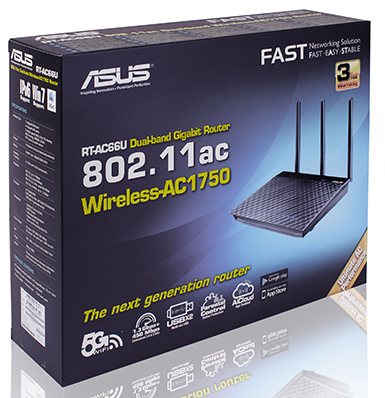 Generally, we are glad about ASUS RT-AC66U wireless router we have reviewed. 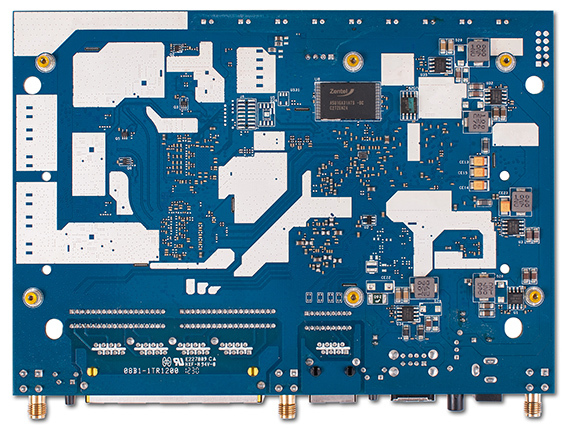 It supports a cutting-edge IEEE 802.11ac wireless standard, but anyway we believe that the vendor could have used a more powerful chip set to as well surprise us with the performance level of the wired segment. We reckon that with the advent of wireless network adapters which support 802.11ac the usage of 5 GHz frequency range will become more common. 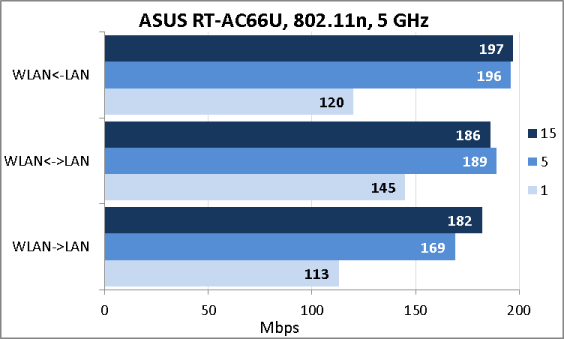 The strength areas of ASUS RT-AC66U are presented below. 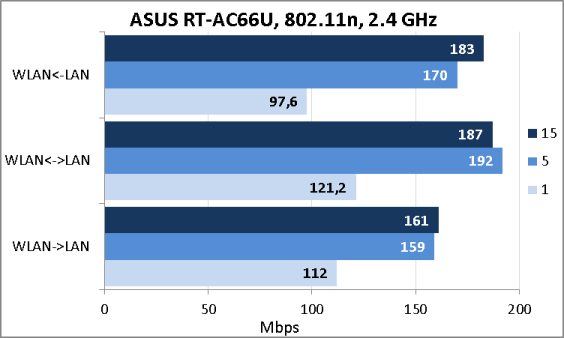 As of when this article was being written, the average price for ASUS RT-AC66U in Moscow online shops was 6600 roubles.